Secures Commercial Trailers by preventing the release of the brakes. For trailers with a palm coupling. Here at Tachpro we recognise that load security is a huge problem for drivers and as such we are proud to now supply the renowned Bulldog range of products. This air line palm lock secures Commercial Trailers by preventing the release of the brakes. Also useful from a health & safety point of view as it prevents unauthorised movement of trailers when loading/unloading. Fits all types of trailers with a palm coupling 48mm dia and 25mm deep at airway. Fitted and used by existing logistics companies. Helps prevent the theft of the trailer and its load. Fantastic quality 300amp starter / charger from Sealey. 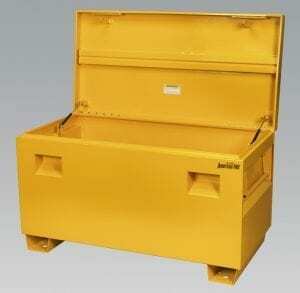 Heavy duty model suitable for most medium to large size garages, workshops and bodyshops. Large wheels for easy moving. Digital display and switchable charge circuitry to give you accurate charging control. Suitable for use in HGV’s, this DoT approved steering wheel lock is a tough bit of kit! Fantastic quality starter / charger from Sealey.